classic song and quite an appropriate title for today's subject matter. The ever important bridal shower. but I still have questions that The Knot just doesn't seem to answer! 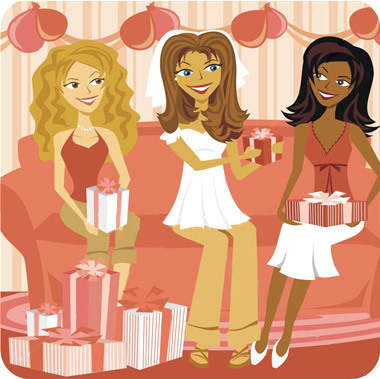 Who is actually supposed to throw the Bridal Shower? Can you ask someone to host one for you? How far in advance can one have a shower? And if none of the bridesmaids have mentioned it is terrible for the bride to mention it? I was thinking about this the other day as I realized there are too many women in my life that I want to celebrate with to have just one shower. but what about the friends that I made at work? or my FB friends & Beauty girls? I want to include them as I've gotten pretty close to a lot of them and it would feel wrong (to me) if I didn't. And isn't it about celebrating love with people you love? But how does one go about this? Any advice, suggestions or help you can offer would be AWESOME. For my wedding, I had a family shower (my aunts threw for me) which also included long time family friends, a "friends" shower thrown by the bridesmaids (typically planned by maid of honor and/or bridesmaids) for all my girlfriends, and my mother-in-laws friends threw me one for their large extended "family" of friends. Etiquitte dictates that only people invited to the wedding should be invited to a shower, unless it's a work place shower...I know this b/c I just threw one. ;) My bridesmaids also did a lingerie "shower" on my bachelorette party weekend. I think showers are typically thrown a month or 2 before the wedding. Hope that helps.